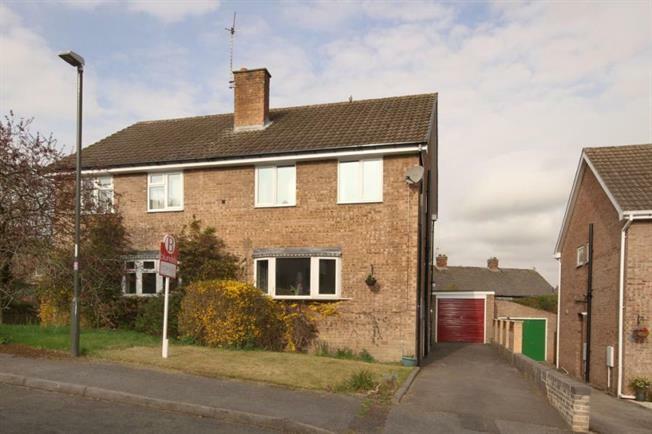 3 Bedroom Semi Detached House For Sale in Dronfield for Guide Price £220,000. Blundells are delighted to bring to the market this lovely three bedroom semi-detached house in the sought after village of Barlow which is available with no onward chain. The house has recently undergone a number of improvements including new facias, soffits and guttering and a new modern bathroom suite. There is still plenty of scope for people to put their own mark on the property. The internal accommodation comprises of an entrance hallway, a generous lounge with bay windowed front which gives the room a nice light and airy feel and a kitchen and partially divided dining room looking out on to the rear garden. Upstairs you find a generous sized master bedroom which has fantastic views out over the countryside. A recently refurbished modern family bathroom with a three piece suite comprising of a bath with overhead shower, toilet and sink. A second double bedroom and a further generously proportioned single bedroom complete the interior accommodation. Outside is a good sized drive for a number of cars and a detached garage with front and rear lawned gardens. Barlow is a popular village location with a good Ofsted rated school and a variety of country pubs and restaurants. Whilst keeping the rural countryside feel you are only a few miles from Dronfield & Chesterfield where you will find larger supermarkets and shops as well as train stations which gives great commuter access to Sheffield and further afield.